PHOTO: Allen Ramsey, DWCPhoto.com. 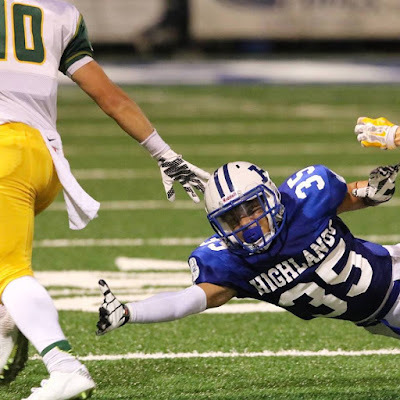 Highlands senior defensive back Taylor Perez (35) attempts to make a tackle in Friday's loss to Louisville St. Xavier. The last time the Highlands Bluebirds football team beat the Louisville St. Xavier Tigers came in 1996. That happened to be one of a state-record 13 times that Highlands finished the season undefeated. The Bluebirds opened the season with a 22-17 win over the defending Class 4A champion Tigers on their way to the Class 3A state championship. Seniors on that team included running backs Justin Frisk and Stephen Lickert along with quarterback P.J. Sauer. It marked the first of 11 state championships under the guidance of 20-year Head Coach Dale Mueller. After the five-point win, no one came within 17 points of Highlands until the state semifinals. The Bluebirds edged Bell County, 16-14 in the state semifinals before beating Hopkinsville, 21-14 in the 3A championship game. Highlands travels to Independence for the first meeting between the two since 1998. The Bluebirds won the last meeting 28-12 after dominating the Pioneers, 76-0 in 1997. The Bluebirds will face an undefeated 5-0 Simon Kenton squad led by junior quarterback Cameron Racke and running back Dillion Powell. The closest game so far came in a 52-36 win at Lexington Bryan Station on Aug. 28. 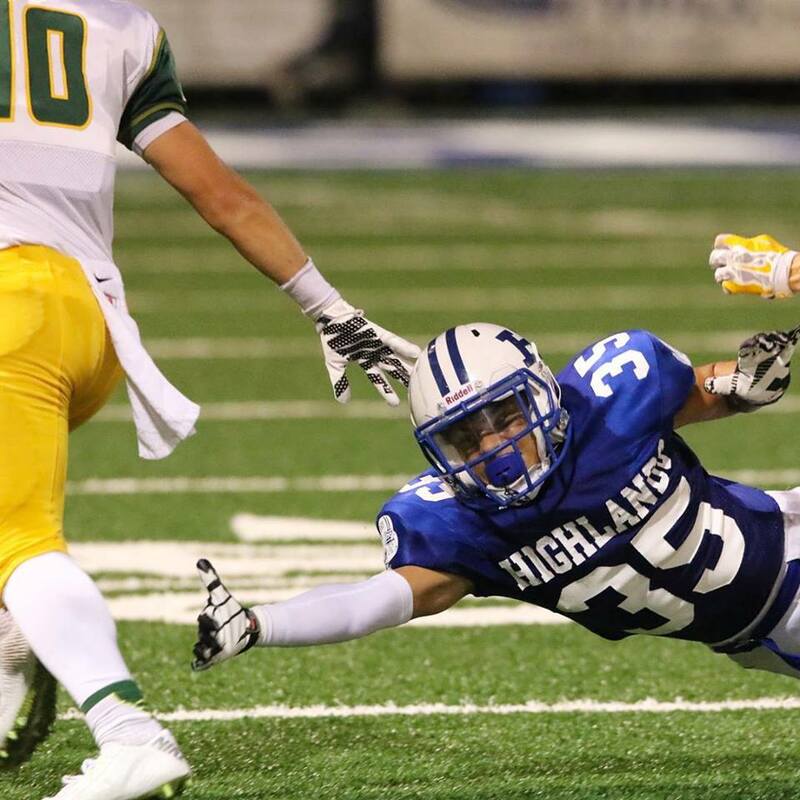 Highlands hopes to avoid a 1-5 start on the season. That also has not happened since 1939 when the Bluebirds opened the year with a 24-0 win over Carrollton before losing eight straight then ending the year with a 33-0 win over Dixie Heights. The 2-8 campaign is tied with the 1922 and 1918 squads for the fewest wins in a season in school history. The Bluebirds have never had a winless campaign. Their only one-win season came at 1-4-1 in 1921. Their last losing season came at 4-5-1 in 1955. The Bluebirds still remain one win shy of 870 in school history. Their overall record is 869-233-26 in 100-plus seasons of football. That undefeated team is the 5-0 North Laurel Jaguars. The Jaguars beat Lincoln County, 50-31 in London on Friday. North Laurel had not experienced any postseason success until last year. The Jaguars beat Whitley County, 48-34 for the first-ever playoff win in school history before losing 41-7 at Southwestern. Bullitt Central also entered the day undefeated at 4-0 but lost 77-42 to Spencer County. Defending 5A champion Pulaski County remains the favorite to win 5A after improving to 3-1 with a 42-22 win at Rockcastle County. Covington Catholic won for the first time this season, 41-21 at Beechwood on Friday. The Colonels are also 1-4 like Highlands. Dixie Heights fell to 0-4 with a 13-12 loss to Conner on Friday. This is the closest the Colonels have come to tasting victory this year. Grant County moved to 3-2 with a 36-22 win over Rowan County on Friday. The Braves snapped a two-game losing streak in the process.